This exploratory qualitative study focused on 1) the learning needs of Aboriginal adult learners residing in selected First Nations communities in rural Alberta and 2) the potential for increasing access to e-learning education. Through open dialogue with First Nations community leaders, Aboriginal adult learners, and Aboriginal and non-Aboriginal adult educators, four key themes emerged from the data: 1) Building Capacity: Onsite Education, 2) Success Factors: Needs and Perspectives, 3) Relationships and Learning: The Human Factor, and 4) Technology: Bridges and Barriers. Recommendations, in response to findings are included. A common scenario of past research in Aboriginal communities has involved outside researchers coming into the community, gathering the needed information, and leaving, never to be heard from again. The adult education landscape continues to shift and reshape. A deeper understanding of the needs of adult learners, the influx of technology to support adult learning programs, and the changing needs of communities, impacted by economic influences and realities, continue to influence how post-secondary institutions respond to the needs, vision, and voices of all stakeholders. This shifting landscape presents significant challenges for adult education institutions that seek to successfully navigate this rapidly changing terrain. What remains constant, however, is the commitment of post-secondary leaders, program planners, designers, and practitioners to be inclusive and responsive to the diverse needs of adult learners, communities, and society. This qualitative study explored the learning needs of Aboriginal adult learners residing in selected, rural First Nations communities within the Service Region of two Alberta post-secondary, community colleges in the province of Alberta, Canada. Researchers sought a deepened understanding as to the interest and readiness of Aboriginal adult learners, and their rurally located communities, to engage with e-learning program delivery. Guided by Henchey (2005), who asserted that we need research and data to know where we are now and where we want to go, researchers engaged in open dialogue with adult learners, Aboriginal community leaders, and Aboriginal and non-Aboriginal adult educators, to gain a deeper appreciation of perspectives, opportunities, and challenges related to expanding access to post-secondary, college courses and programs through e-learning to rural Aboriginal communities. In 2010, Bow Valley College, in partnership with other provincial colleges and the Ministry of Advanced Education and Technology, conducted research that focused on assessing the needs and developing recommendations for the provision of quality delivery of online learning to diverse student populations. In a research report generated from this 2010 study, Shimoni and Barrington (2010) stated that Aboriginal adult learners were identified as one of the “traditionally underrepresented [groups of learners] in post-secondary education” (p. 4), noting that little documentation was available pertaining to e-learning access and post-secondary education. In a subsequent study also led by Bow Valley College, Aboriginal adult learners were once again identified as being unrepresented in the study. In addition, rural Aboriginal adult learners were identified as “facing a number of [unique] challenges in accessing traditional forms of education” (Shimoni, Barrington, & Wilde, 2010, p. 41). In response to recommendations that evolved out of these two aforementioned studies, Bow Valley College engaged in discussions with internal and external stakeholders regarding the learning needs of Aboriginal adult learners residing in rural communities within the College’s geographic Service Region. Out of these discussions, a decision was made to conduct further research that focused on the learning and support needs of rural Aboriginal adult learners. The good work of these prior research initiatives served as the impetus for this study. Draw from lessons learned, having had significant experience in developing distance-delivery college programs. Build on collaborative/standing relationships with Aboriginal communities/reserves within the College’s geographic/Service Region. Collaborate with Aboriginal colleagues from selected First Nations communities in the Bow Valley College and NorQuest College Service Regions for the purpose of expanding career program access to prospective adult learners living in these areas. Propose a model for a distance/blended delivery “Pilot Program” to successfully link and support prospective adult learners in Aboriginal communities to career programs offered through Bow Valley College and NorQuest College. Expand access to post-secondary education by launching new programs in smaller communities in rural areas. Expand the number of College online credentials. Contribute to the preparation of the Aboriginal adult workforce in rural Alberta. Expand services/programs for Aboriginal peoples. Significance and shared benefits. This research had the potential to benefit research participants, local communities, participating Colleges, and the larger researcher community. Potential benefits for participants included: to give voice to rural First Nations communities regarding the educational needs and concerns related to Aboriginal adult learners, and to increase flexibility and access to post-secondary education by launching new programs in smaller, rural First Nations communities. There were also potential benefits to local rural communities that included: to better inform and engage post-secondary institutions in the province of Alberta in the development of e-learning adult education programs in rural areas within the province, to determine adult education/career program needs of First Nations communities and of Aboriginal adult learners residing in these communities, to expand the number of e-learners and Aboriginal learners in rural communities, and to contribute towards the development of capacity and workforce preparation in rural communities. Potential benefits for participating Colleges included: to further develop, strengthen, and build new relationships with First Nations (rural) communities and with Aboriginal adult learners residing within rural communities; to better understand the educational needs of prospective Aboriginal adult learners residing within First Nations communities; to assist First Nations in meeting their educational needs, and building towards their communities; to expand and deepen the research capacity in participating Colleges; and, to inform participating Colleges in the development/delivery of distance programs for Aboriginal adult learners in rural areas. The larger research community will also benefit from this research through a deepened understanding of the educational needs of prospective Aboriginal adult learners in rural settings. This research will inform future development and e-learning initiatives and will contribute to the literature (through research findings/publications) on the needs of Aboriginal adult learners who wish to successfully engage with/participate in distance, adult education programs. The Aboriginal Centre Director, the Director of Learner Success Services, and one research assistant, all from Bow Valley College, and one external consultant/lead researcher (Associate Professor from the University of Calgary) formed the research team. The Aboriginal Centre Director (a band member from the Piikani Nation), guided researchers on cultural protocol and sensitivities when engaging with First Nations communities. The external consultant/lead researcher provided additional guidance/mentoring, drawing from her collaborative research experiences with Indigenous peoples in Western Australia. In addition, this research project benefitted from the expertise of a Bow Valley College project manager. Aboriginal learners have been identified in the literature as “the most disadvantaged segment of the Canadian school population” (Canadian Council on Learning, State of e-learning in Canada, 2009, p.86). While there is little literature focusing specifically on adult Aboriginal learners’ needs, what is often acknowledged in government reports and documents is the lack of Aboriginal learners at a post-secondary level (Canadian Council on Learning, Post-secondary education in Canada, 2009; Sisco, 2010; Steel & Fahy, 2011). Although, as of 2006, the gaps in this trend are slowly shrinking, only 42% of Aboriginal young adults (25-34) held post-secondary credentials compared to 68% of non-Aboriginal learners (Canadian Council on Learning, Post-secondary education in Canada, 2009). That being said, the educational gaps appear more widely in universities, whereas Aboriginal enrolment in colleges and trade schools are now coming to par with non-Aboriginal learners (Fahy, Steel, & Martin, 2009). Moreover, there are educational gaps between Aboriginal learners living in urban centers and those living on reserves and/or rural and remote communities. The latter showed less successful educational outcomes than their urban counterparts (Sisco, 2010; Steel & Fahy, 2011). Distance and online learning opportunities have the potential to address this gap by providing educational supports and opportunities for learners in their home communities. The literature indicated a much lower level of high school graduation rates among Aboriginal learners compared to non-Aboriginal learners. This presents a clear barrier in attending post-secondary education (Canadian Council on Learning, Post-secondary education in Canada, 2009; Gruber & Coldevin, 1994; Philpott, Sharpe, & Neville, 2009; Sisco, 2010). Moreover, among Aboriginal learners, those located in rural locations suffer the lowest academic levels compared to their urban counterparts (Philpott, Sharpe, & Neville, 2009). Academic upgrading can then act as an integral step in the sometimes long and arduous process of attaining a post-secondary degree. Even for those Aboriginal students who do complete their high school degrees, some of the reported low quality and under-funded K-12 education found, especially in rural or remote reserves, often deems it necessary for students to take academic upgrading courses as adults to fulfill high school academic requirements (Alberta MLA Committee on First Nations, 2010; Sisco, 2010). Although this research focuses on adult learners in post-secondary environments, this is relevant to our research as the quality of basic education greatly affects one’s ability to succeed in post-secondary contexts. Recent studies demonstrated the relationship between high school graduation rates and post-secondary school success, with significant praise attributed to e-learning (Sisco, 2010). The literature identified many barriers faced by rural, adult Aboriginal learners regarding accessing education at a post-secondary level. Access. There are few post-secondary schools located on or near many Aboriginal learners’ home communities, forcing learners to relocate or face long commutes in order to attend school (Canadian Council on Learning, State of E-learning in Canada, 2009; Steel & Fahy, 2011). Many learners face low attendance rates or simply drop out of urban-based post-secondary schools due to lack of reliable transportation to travel from rural to urban communities (MLA Committee on First Nations, 2010; Steel & Fahy, 2011; Facey, 2001). Even if reliable transportation is attainable, the cost of travel expenses andarduous daily commutes, prove to be barriers to educational attendance (Facey, 2001; Hick, 2002; Steel & Fahy, 2011). In direct connection with the inability to get to urban post-secondary schools, many rurally located Aboriginal learners do not want to leave their home communities and their families to attend school (Alberta MLA Committee on First Nations, 2010; Fahy, Steel, & Martin, 2009; Rao & Guili, 2010; Sisco, 2010; Steel & Fahy, 2011). Moreover, the desire to remain in their home communities also relates to financial barriers that occur once relocation is required to attend post-secondary programs (Fahy, Steel, & Martin, 2009). For those students who did venture away from their home communities to attend either public or post-secondary schooling, the literature reported that experiences of discrimination and racism affected educational experiences. This contributed to many Aboriginal learners being leery of formal educational institutions (Fahy, Steel, & Martin, 2009; Sisco, 2010). This wariness is only enhanced by the residual traumas of residential school experiences that affect many Aboriginal learners, creating a general distrust of the formal educational system (Gruber & Coldevin, 1995; Sisco, 2010; Philpott, Sharpe, & Neville, 2009). It is because of these barriers that many Aboriginal leaders, in a 2010 provincial report on First Nations Workforce Planning, advocated for more distance, online or e-learning opportunties to be available for rural Aboriginal communities (Alberta MLA Committee, 2010). Technology. Technological barriers in accessing distance and online educational programming from rural and remote communities were also identified in the literature. Poor Internet connectivity proved to be a significant barrier to accessing distance education courses and in accessing information that would lead to entering an educational program (Alberta MLA Committee to First Nations, 2010; Rao & Guili, 2010; Philpott, Sharpe, & Neville, 2009). Moreover, not every learner has access to personal computers in their households, making them rely on shared computers at local community or learning centres, if available (Fahy, Steel, & Martin, 2009; Hick, 2002; Philpott, Sharpe, & Neville, 2009). Indeed, financial and geographical barriers can prevent the installation, access, and maintenance of technological Internet requirements needed to access e-learning programs (Sisco, 2010). While access to broadband was cited as a barrier to online education, the Canadian government is beginning to recognize this as an issue for Aboriginal and remote learners and is starting address the barrier of technological access (Sisco, 2010). The addition of technological access must be accompanied by relevant teaching and learning that would ensure that rural and remote learners are using technology to their best advantage (Berkshire & Smith, 2000; Hick 2002). Learning styles. It is significant to note that the education system does not make adequate provisions to accommodate the unique learning styles of Aboriginal people (Alberta MLA Committee on First Nations, 2010; Rao & Guili, 2010; Sisco, 2010; Steel & Fahy, 2011). The literature suggested that simply providing technological access to distance education programming is not enough to ensure learner success; cultural sensitivity to learning styles and cultural and linguistic traditions of Aboriginal learners is paramount. As stated by Berkshire and Smith (2000), pedagogical decisions require full consideration of students’ personal histories as learners, linguistic strengths and obstacles, group mores relative to academic performance, and wider social and cultural realities (p. 29). The unique learning styles of Aboriginal people calls for an increased flexibility, not only in the design of the curriculum and syllabi, but also in delivery modes and instruction (Fahy, Steel, & Martin, 2009; Hick, 2002; Rao & Guili, 2010; Sisco, 2010; Steel & Fahy, 2011). A number of factors contributing to Aboriginal adult learner success were cited in the literature. Motivation. Despite the numerous barriers in attaining a post-secondary education, the literature cited a strong desire among rural Aboriginal learners to obtain post-secondary training or a degree (Philpott, Sharpe, & Neville, 2009). Participants of all ages and educational backgrounds acknowledged the value that e-learning provided in accessing programs and courses that would otherwise be unavailable to rural learners (Philpott, Sharpe, & Neville, 2009). Distance learning. High success rates of distance and online learning, among Aboriginal learners of all ages, were cited in the literature (Philpott, Sharpe, & Neville, 2009). Surveyed participants demonstrated equal performance rates in distance and web courses in comparison to face-to-face coursework (Philpott, Sharpe, & Neville, 2009). This resulted in a sense of increased confidence and pride among learners; moreover, students could now envision increased educational/career options available to them (Philpott, Sharpe, & Neville, 2009; Sisco, 2010). Due to the self-disciplined, self-regulated nature of online and distance learning, the literature also gleaned personal benefits and growth that emerged from engaging in this type of learning (Philpott, Sharpe, & Neville, 2009). In addition to increased academic confidence, surveyed participants demonstrated an increase in personal skills, namely: time management, computer literacy, independence, and work ethic (Philpott, Sharpe, & Neville, 2009; Sisco, 2010). A benefit in offering distance and online learning opportunities to remote and rural Aboriginal communities is that this provides students with access to qualified and specialized instructors, a resource often lacking in rural or remote, onsite, public and post-secondary institutions (Phipott, Sharpe, & Neville, 2009; Sisco, 2010; Gruber & Coldevin, 1995). As the literature demonstrated a lack of technological skills among rural adult Aboriginal learners, if instructors could be technologically literate, the rate of student success could only increase (Sisco, 2010). Support services, better libraries, counseling services, online learning labs, and technical supports were also cited a lacking in under-funded, on-reserve schools (Sisco, 2010; Rao & Guili, 2010). Relationship formation. Learners-instructor connection, whether via email, phone or fax, was identified as an essential component contributing to distance and online learner success and program completion (Facey, 2001; Philpott, Sharpe, & Neville, 2009; Rao & Guili, 2010; Steel & Fahy, 2011). The literature also demonstrated a preference for some form of face-to-face consultation in addition to online instruction, especially for courses (such as math) that can be difficult to tutor via email (Steel & Fahy; Rao & Guili, 2010; Philpott, Sharpe, & Neville, 2009). Opportunities for online discussions and forums, web conferences, and other forms of student interaction were greatly favoured by participants(Rao & Guili, 2010). Synchronous versus asynchronous learning, based on the desire for consistent opportunities to connect with others, was also identified as a strong preference (Rao & Guili, 2010; Philpott, Sharpe, & Neville, 2009). Several key themes were identified in the literature regarding addressing some of the aforementioned challenges and barriers to Aboriginal learner success. These themes related specifically to learners residing in rural locations. Connectivity with community. One key factor was a need for community-based, educational programming in thatAboriginal learners are more likely to succeed when the educational programs are linked to their home communities (Canadian Council on Learning, Post-Secondary Education in Canada, 2009; Sisco, 2010). Responding to unique learning needs. Having culturally adapted curricula and syllabi were noted by Aboriginal learners as key factors in overcoming the barriers faced by Aboriginal learners (Canadian Council on Learning, Post-Secondary Education in Canada, 2009). Failing to address the unique learning styles of Aboriginal learners was noted as a key factor impacting success or failure (McMullen & Rohrback, 2003; Sisco, 2010; Steel & Fahy, 2011). Learner attributes and readiness. As Meyer (2003) noted, independent and visual learners are more likely to succeed in online or distance programming. Moreover, students with well-developed time management skills, are self-motivated and self-directed, and who are well organized, will also fare better in distance and online education programs (Cuthell, 2002; Barbour & Mulcahy, 2002; Rao & Guili, 2010). Finally, learners who are confident and familiar with technology are more likely to succeed in online learning mediums (Hason & Jubeck, 1999). Researchers elaborated further and stated, “The involvement of Aboriginal participants and communities should be incorporated into all stages of the research process. Aboriginal people should be the ones who determine the issues or topics to be researched as well as the design and development of the research components” (p. 11). The design of this research remained sensitive to the cautions and concerns expressed by Kenny et al. (2004). Networking (dialogues) with individuals residing in selected rural Aboriginal communities focused on information sharing, building trust , and ensuring that all steps in the research process were respectful, collaborative, and guided by authentic, open dialogue. An integral element of this study involved informal networking with community members in rural First Nations communities. Phase I: Networking (3 months). Networking with First Nations communities preceded formal research activities. This provided rich opportunities to engage informally with community members from rural First Nations communities to explore the potential benefits of collaborating in this study. 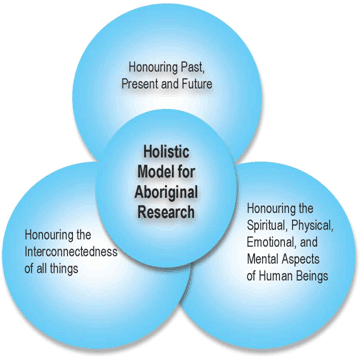 Kenny, Faries, Fiske and Voyageur (2004) stated that, too frequently, research in Aboriginal communities benefits researchers with, little or no benefit to participants or communities. Throughout this networking phase, and in the spirit of authentic collaboration and engagement, researchers were guided by critical questions posed by Aboriginal researcher/scholar, Linda Tuhiwai Smith (1999): “Whose interests does [are being] serve[d]? Who will benefit? Who has designed its questions and framed its scope?” (p. 10). Networking included informal discussions with First Nations community members, visiting schools, and participating in smudge ceremonies, feasts, and other gatherings organized by community members. Networking built trust and a deepened understanding of relationship elements foundational to collaboration with Aboriginal communities. Networking was critical in that individuals were provided an opportunity to reflect and determine if they were interested in self-identifying as research participants. Phase II: Data collection (4 months). Phase II focused on data collection and included one-on-one dialogues and focus groups. All dialogues with learners and community members occurred in rural areas where participants studied and/or resided. Some focus groups and one-on-one dialogues with educational leaders were scheduled, on-campus, in Calgary and Edmonton. Phase III: Data analysis (3 months). All members of the research team participated in Phase III: data analysis. This approach involved multiple reviews of data collected and storyboarding of emergent dominant themes and sub-themes. This exploratory qualitative study sought a deeper understanding and appreciation of the learning and support needs of rural Aboriginal adult learners with respect to successful access and engagement in e-learning adult education courses and programs. Guided by open, free-flowing dialogue with all research participants, approaches to all aspects of this research were culturally sensitive and responsive to Indigenous epistemology and (oral) knowledge sharing traditions. Dialogue. Dialogue is not comprised of a list of predetermined questions and assumptions. Rather, dialogue is a creative process and is not intent on “[getting] participants to move toward a predetermined goal … dialogue [is] an opportunity for thought and feeling to play freely … [whereby] any subject can be included and no content is excluded” (Bohm, Factor & Garrett, 1991, Why Dialogue section, para. 6 ). Welcoming of diversity of thought, feeling, perspective, approach, and lived experience, dialogue seeks to explore and understand diverse perspectives and world-views. Dialogue, by its very nature, provides safe space in that participants share equal opportunity and power when identifying topics of interest related to guiding themes presented by the researcher. Bohm et al. (1991) maintained that dialogue supports “a stream of meaning flowing among and through us and between us … out of which may emerge some new understanding” (p. 6). Bohm (1998) stated that “this shared meaning is the ‘glue’ or ‘cement’ that holds people and societies together” (p. 6). Dialogue speaks to wholeness and is about emptying a space in order to create room for the co-creation of new knowledge and understanding. Forty-seven participants engaged in this study: Aboriginal adult learners living on reserves/in program (27); Aboriginal adult learners living on reserves/planning to enroll (6); Aboriginal community leaders (4); teachers/instructors in rural, Aboriginal settings, Aboriginal/Non1 (7); and, College leaders (3). All research participants (learners, teachers, community leaders, college leaders) resided, studied, and/or worked within the geographic Service Regions of participating Colleges. Adult learner participants were provided the option to identify age and gender. Participants’ age range spanned from 18 to 54 years of age. Twelve adult learner participants identified as female, 19 as male, and two as unidentified. The age and gender of community/College leaders, and teachers/instructors were not considered relevant to this study. Researchers engaged in dialogue with Aboriginal adult learners, community leaders, and educators. One-on-one and focus group (dialogue) forums were the chosen methods of inquiry. Participants identified which forum(s) they were most comfortable participating in. These forums provided ‘space’ for participants to identify topics of personal interest that aligned to the overall purpose and objectives of this study. All but four dialogues took place face-to-face; three individual dialogues were conducted through the SKYPE online medium and one individual dialogue occurred over the telephone. Dialogues and focus group discussions were captured via audio tape and/or hand-written notes. Data collection also included reviewing relevant documents (previous studies and commissioned reports) that addressed the learning and support needs of Aboriginal adult learners. A process of inductive analysis informed research findings. Through this process, patterns, themes, and categories were “discovered,”rather than applying deductive analysis, where major themes and categories are structured at the onset (Patton, 2002). Throughout this process, the research team generated “indigenous typologies or analyst-constructed typologies to reflect the understandings expressed by the participants” (Patton, 2002, as cited by Marshall & Rossman, 2006, p. 159). Data analysis was conducted without the assistance of qualitative software. Taped dialogues were listened to three or four times and reviewed by two or three research team members. Detailed notes were taken throughout all listening sessions and participant quotes were documented on sticky notes and placed randomly on flip chart paper. Using a storyboard approach, sticky notes and quotes were clustered into sub-themes and subsequently grouped into major dominant theme areas/categories. This organic/naturalistic approach aligned to the essence of dialogue, where space is created to explore and make meaning of significant learning moments and experiences. As dialogue opens up a space for themes to emerge, direct quotes that repeatedly made reference to a particular theme, issue, and/or challenge, are included in the findings. Reporting the findings in this way ensured the integrity and intentions of this study to provide a space for participants to voice perspectives on “education”--perspectives and experiences that extended beyond e-learning program development and delivery. Dialogues were rich and personal. Participants shared stories of lifelong learning and experiences in traditional, Aboriginal, and non-Aboriginal learning environments. Four dominant and interrelated themes emerged from the data. This interrelatedness emerged out of the spiral, circular nature of dialogue. Building Capacity: Onsite Education. Onsite education, delivered by the two participating colleges, was referred to as a significant benefit to many participants. I like it that I can be here in my community and take courses from a college. My family is proud of me. Several participants expressed concerns that some high schools on reserves were viewed as substandard to urban schools. I went to high school here and didn’t get the same as regular, city education. We need better schools. Too many drop out, hang around, and get into trouble. That’s what I did. Better high schools would fix this. And another: Aboriginal schools fall short. We lag behind where we would be if we were in the normal system. Although some participants expressed interest in relocating to the city, most desired more space on the reserve to accommodate larger class size. Community leaders identified youth leadership as a priority in support of community and capacity building. Our pathway to change is to invest in the future of our people. In the words of one community leader, if we are to achieve the vision we have for my people, where we thrive and are self-sufficient, we need to understand it is our young people that will drive change. And another, our young people are our future Elders. Some of our Elders could be in the schools, spending time with our youth. In addition, more space and qualified teachers and other ways of knowing by way of other community-based activities, because education means many things, were frequently cited as priorities to support learner success. Success Factors: Needs and Perspectives. Success factors spanned community concerns, political influences, availability of resources, learning styles and challenges, poor attendance, inadequate funding, family struggles, addiction, technology access, and rural constraints to access resources available at urban campuses. Transportation was cited as a main concern for those who wished to attend urban, post-secondary programs. I have been trying to go to school in Calgary for two years now. When I was there the first time, I had good transportation. Now, the truck is broken. “Main campus:” represented more resources and more acceptance. And, for a learner who self-identified as two-spirited (homosexual), there are more people like me there. I don’t feel safe here although this is my home. Being different is easier in the city. Lack of childcare support was another barrier to success. Even when I have transportation, I don’t have child care. If I could bring my kids to school that would be good for me. I would study more than and would have finished my course by now. And from an older, prospective learner, sometimes I need to stay home to take care of my grandchildren. Technology challenges, availability, and not enough teachers were frequently cited. I come to school because I want to be on the computer. I can’t get Internet at home. Most participants asserted that they learn best when they feel close/connected with peers and teachers. Other needs included: one-on-one time with teachers, a slower pace, and working independently while others work in the same room. One participant shared I need to be shown, hands on, with the teacher talking to me with her hands. I don’t read so well. Most identified oral teaching and step-by-step learning as how I learn best. Diversity within communities, beyond learning styles, was emphasized. Challenges included: a vast range of priorities identified within the same community and where funding should be allocated relative to needs and priorities; varied degrees of comfort/discomfort, amongst community members, on how decisions are made; varying opinions on seeking partnerships with business/industry initiatives in other First Nations communities; degrees of comfort/discomfort with “outsider” professionals working on reserves and so on. In the words of one leader: We are one people in spirit but there is diversity amongst us. This is one of our biggest challenges. Relationships and Learning: The Human Factor. How relationships significantly impact learners and learning processes received the most attention. I need to be with others when learning. With an emphasis on one-on-one teacher/student contact within a larger group context, teachers were referred to as my mentor and someone who walks with me in learning. Feeling connected to peers meant a family atmosphere here at school…the good part of family. That’s why I come. Relationships extended to mentoring programs in schools. Older and younger members of our community can mentor one another and our younger people can help with this. One college leader shared, it’s all about relationships. It all comes back to this. Aboriginal students experience limited success and it is not about delivery like video conferencing. Issues remain because sites are not properly set up like “Mother Bear”…running about to care for students, mitigating things. Teacher participants addressed numerous roles/responsibilities. I provide emotional support…encouragement as much as I focus on teaching. And, all our students need support. And another, low self-confidence is the biggest barrier so I’m teacher, mentor, mother, friend, nurse, counselor. Technology: Bridges and Barriers. Participants who had successfully navigated e-learning landscapes were eager to share successes. I had some problems coming to school. One positive is you can go to any building with a computer to do your course. That’s what I did and I didn’t fall behind. And another, I liked the convenience of the online Adobe math course. I felt safe…no one laughed if I didn’t understand. Connecting with others through technology motivated many participants. My online instructor asked lots questions. It was just like sitting around in a group here at school. And, I really liked Adobe. I could see faces; hear voices. It was better to do it here because I could be with other campuses. And, it’s like doing group work with others far away. Seeing through Skype was good for our class. Social networking was identified as a primary motivator for learning how to use technology and Facebook as the priority social networking forum. I come to school and do my courses but I want to have time for Facebook. I like getting messages on Facebook…makes me feel remembered. Many participants had or were saving for IPods to access social networking sites. Internet access in communities was cited as a major obstacle, however. Participants frequently referred to going out to the main roads on a weekend to find an Internet connection by holding phones above their heads to catch a signal. Teachers and community leaders referred to social networking devices as ‘untapped potential’ in rural adult learning environments. With reliable Internet access, Facebook and Twitter could be used to post notices, follow up on attendance concerns, and share resources. One Aboriginal teacher suggested Facebook as a funeral alert to family members who resided in different locations. Another suggested ‘You Tube’ to teach drama and to conduct live labs. Learners also shared apprehensions. I didn’t complete a module once, nobody noticed. If the teacher was here she would notice. I never finished that course. And, if you do it at home you won’t do it. I’m not motivated to do it if I’m not here…I think that if you are doing courses on computers you won’t finish them. Lots of that happens around here. One participant shared that there was no immediate help when I needed it and there’s too many online at the same time. I sit there like a dummy, quiet. And another, I think I know the instructor but they don’t know me. They can’t see me. Twelve recommendations emerged in support of enhancing education opportunities and initiatives and expanding e-learning for rural Aboriginal adult learners. Vision/goal statements follow each recommendation. This study confirmed interest in and potential for expanding educational e-learning access to rural Aboriginal communities. A critical qualifier, however, was the focus of all participants on supports needed for Aboriginal adult learners to succeed in adult education programs. Specifically, participants emphasized the need for human interaction, on-site support, encouragement, hands on learning, and interactions with other learners as paramount. Consequently, modes of delivery were secondary to the human interaction and support needs of rural Aboriginal adult learners. Not unlike supports for learner success in face-to-face program delivery, Aboriginal adult learners who engage in e-learning need onsite resources and close interactions with peers and teachers. In the words of a college leader: It is not so much about e-learning delivery. It is all about onsite resources. In other words, even face-to-face teaching will fail if these supports and a strong focus on relationships between learners and teachers are lacking. It really is all about relationships. An either/or approach regarding program delivery mediums did not emerge as the primary issue. Participants were clear, however, that technology should never supersede the most critical factor impacting Aboriginal adult learner success; that being, human interaction and engagement! 1 Aboriginal/Non (7) refers to the number of instructors who were teaching within an Aboriginal, adult learning environment and who volunteered to participate in this study. Some instructor participants were Aboriginal and some were non-Aboriginal. All taught Aboriginal adult learners in rural settings. Berkshire, S., & Smith, G. (2000). Bridging the great divide: Connecting Alaska native learners and leaders via “high touch-high tech” DL. In L. Berry (Ed. ), Monograph series of the National Association of African American Studies. Houston TX: National Association of African American Studies. Bohm, D. (1998). What is dialogue. In L. Ellinor and G. Gerard, Dialogue: Rediscover the transforming power of conversation (pp. 19-27). New York, NY: John Wiley & Sons, Inc.
Cuthell, J.P. (2002). A learning community – A community of learners. Journal of Interactive Learning Research, 13(1), pp. 167-86. Facey, E. (2001). First Nations and education by Internet: The path forward, or back? Journal of Distance Education, 10(1), pp. 113-125. Fahy, P., Steel, N., & Martin, P. (2009). Preferences of residents in four northern Alberta Communities regarding local post-secondary programming. International Review of Research in Open and Distance Learning, 10(3), pp. 1-21. Gruber, S., & Coldevin, G. (1994). Management training at a distance for Inuit administrators: The Atii project. Journal of Distance Education, 9(2), pp. 21-34. Henchey, N. (Spring 2005). Aboriginal education: Towards a brighter future. Society for the advancement of excellence in education. Society for the Advancement of Excellence in Education (SAEE). Hick, S. (2002). Connecting Aboriginal learners in remote communities: An online social work course. Journal of Technology in Human Services, 20(3/4), pp. 267-81. McMullen, B., & Rohrbach, A. (2003). Distance education in remote Aboriginal communities: Barriers, learning styles and best practices. Prince George, BC: College of New Caledonia Press. Marshall , C., & Rossman, G. (2006). Designing qualitative research (4th Ed.). Thousands Oaks, CA: Sage. Rao, K., & Guili, C. (2010). Reaching REMOTE learners: Successes and challenges for students in an online graduate degree program in the Pacific Islands. Shimoni, R., & Barrington, G. (August 31, 2010). Meeting the Needs of Diverse Students Engaging in e-Learning, Phase I, Research Report. Bow Valley College, Calgary, AB., Canada. Shimoni, R., Barrington, G., & Wilde, R. (August 31, 2010). Successful Practices in Supporting Students in Distributed Learning, Final Report, Bow Valley College, Calgary, AB., Canada. Tuhiwai Smith, L. (2001). Decolonizing Methodologies: Research and indigenous peoples. New York: Zed Books Ltd.
* This study was funded by Bow Valley College, ARDN, and eCampusAlberta. NorQuest College collaborated in this initiative. Kate Beamer (MA) was employed as a research assistant at Bow Valley College, Calgary, Alberta, when this research was conducted. She is no longer employed at the College.